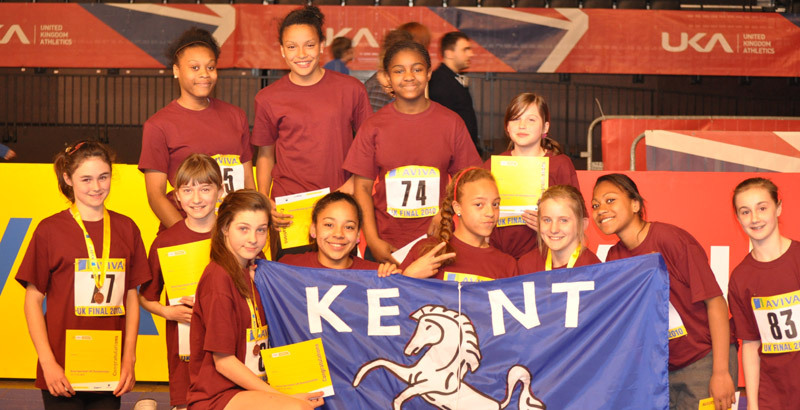 It was a first for Kent - a team through to the Sportshall National Athletics Final at the LG Arena in Birmingham. The U/13 Girls’ put up a fantastic show of determination which culminated in the Kent team finishing 3rd just one point behind second-placed Warwickshire. A terrific result out of 12 teams from all around Great Britain. Alex Wheelwright (Blackheath & Bromley) became the U/13 National Sportshall High Jump Champion. 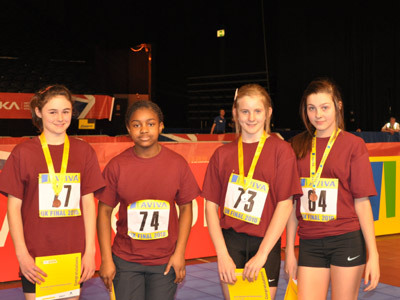 Three girls all jumped the same height of 1.45m including Shannon Clarke (Blackheath & Bromley). Alex won on count back with Shannon taking the Bronze medal. Two more medals were won in the Vertical Jump. 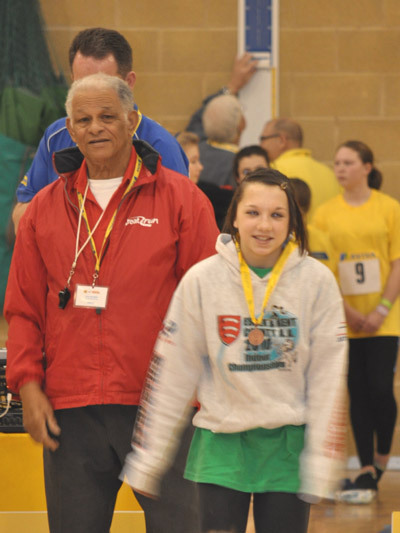 Ememobong Unoh (Ashford A.C) won a Silver medal with 59cm and Rhiannon Wallwork (Swale) the Bronze 58cm. Aine Hurlock (Blackheath & Bromley) just missed out on medals in her 2 lap race finishing 4th and her Standing Triple Jump also 4th 6.63m. Rachel Laqeretabua (Paddock Wood A.C) came 5th in the Shot Putt with a PB of 9.47m. Shannon Cordell (Blackheath & Bromley), who substituted for an injured Amber Currie, joined Samantha Leighton (Blackheath & Bromley) for the 8 lap Paarlauf and came a creditable 5th. Renique Joseph (Bexley), Tamara Anderson (Thanet RR), Charlotte Dryland (Ashford A.C) and Kate Boniface (MKA Panthers) made up the rest of the Kent team. For the first time in the history of Kent Sportshall the U/13 Girls won the Regional Final for their age group and have qualified for the National Final in Birmingham on the 18th April. No one realised until it was announced at the final presentation that the Kent team had won. Alex Wheelwright (Blackheath & Bromley) started the day off with a win in the High Jump 1.45m with Shannon Clarke (Blackheath & Bromley)finishing 6th with 1.35m. Ememobong Unoh (Ashford A.C) won Gold in the Vertical Jump with 63cm. Rhiannon Wallwork ( Swale) claimed the Silver with 54cm. Tamara Anderson ( Thanet RR) won the Standing Triple Jump 6.57m with Aine Hurlock ( Blackheath & Bromley) in 4th place with 6.36m. 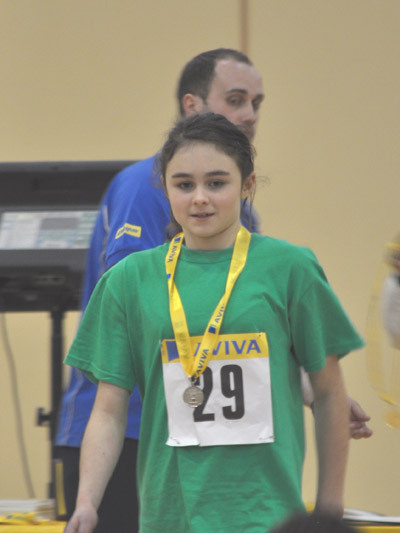 Aine won a Bronze Medal in the 2lap race. Charlotte Dryland (Ashford A.C) won the Speedbounce with 83, Samantha Leighton (Blackheath & Bromley) was =4th in this event 76. 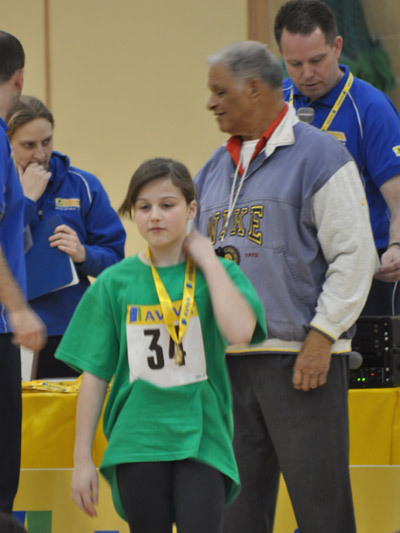 Kate Boniface (MKA Panthers) came 4th in the Standing Long Jump 2.17m. Amber Currie (Thanet RR) won her 4 lap heat, in the final she finished in the Bronze medal position. 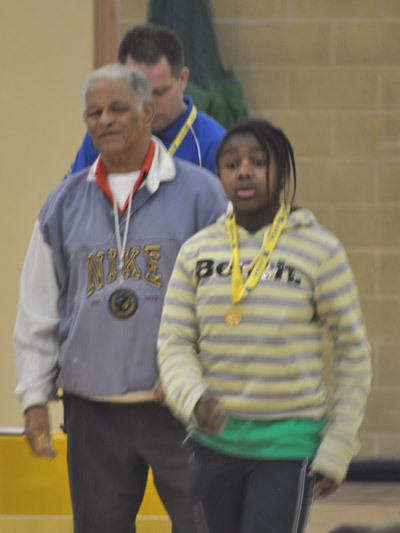 Rachel Laqeretabua (Paddock Wood A.C) came 5th in the Shot 8.83m and Renique Joseph (Bexley A.C) 6th 8.54m. Unfortunately due to injury the U/13 boys team was not complete, but luckily only one event was not covered. Lewis Church( Sevenoaks A.C) won a Silver medal in the High Jump 1.45m, Ben Isaac ( Ashford A.C) jumped 1.35 to finish 9th. 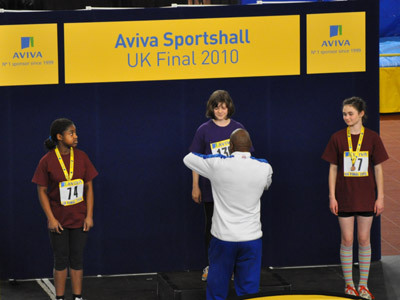 Oliver Williams (Ashford A.C) claimed 2 Silver Medals one in the Standing Triple Jump 7.84m the other in the 2 lap race. Daniel Steadman ( Ashford A.C) won a Bronze in the Speedbounce with 74, Peter Andrews( MKA Panthers) who jumped just one less, 73, had to settle with 5th place. Alex Lynch (Ashford A.C) and Kieron Hawkins (Invicta EK) covered the Vertical Jump. Ben Phillips (Ashford A.C) covered the Shot. Joseph Holland (Paddock Wood A.C) who had run in the County X/Country Champs the day before, ran the 6 lap time trial and Connor Sheahan ( Paddock Wood A.C) who came into the team on Saturday to help out did the Standing Long Jump. The Boys Finished 5th. For the first time in 3 years Kent had a complete U/15 boy’s team. 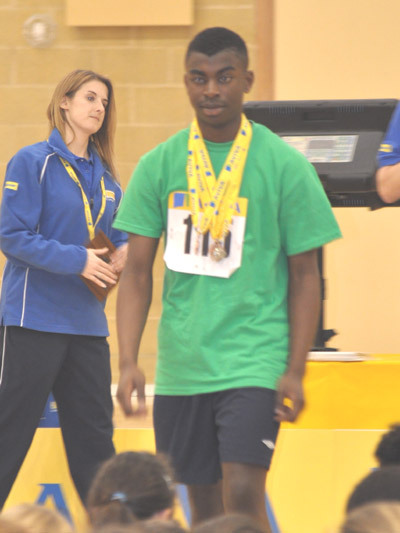 Nathaniel Fatola (Ashford A.C) won 2 Silver Medals one in the 2lap race the other in the Standing Triple Jump 7.86m, he finished 4th in the Speed Bounce with 80. 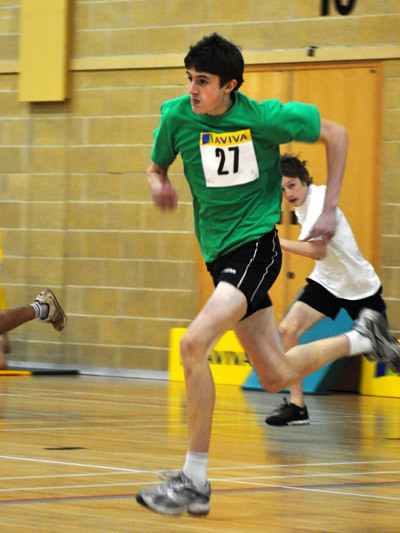 Tom Snare (Ashford A.C) won a Bronze medal in the Shot 12.14m. In the individual all rounder event, with more than 40 athletes taking part Nathaniel won the bronze medal for finishing 3rd overall.136 points. Tom Williams (Ashford A.C) came 8th with 124 points Sam Ratcliff (Paddock Wood A.C) 29th 75 points. Tom Snare 30th 74, Temi Banwo (Ashford A.C) 33rd 72 points James Proporowicz (Dartford) 34th 69 points. Bruno Myszka- Redar (Blackheath & Bromley) just did the 8 lap paarlauf. In the all- rounder event each athlete has to compete in 3 events which means that quite often an athlete will be doing events they do not normally do. The boys finished 3rd. Three athletes competing still have another year in this age group. Anna Alvarez ( Invicta EK) was the only medal winners in the U/15 girls,coming 3rd in the Shot with 9.40m.There were several 4th places Catlin Dock (Ashford A.C) Speedbounce 84, Lauren Bamford (Ashford A.C)Speedbounce 84 and Holly Fletcher (Blackheath & Bromley) in the 4 lap race . Catlin was the highest placed Kent athlete in the All-rounder event finishing 9th 109 points, Anna Alvarez 12th 108 points, Kayleigh Miller Leslie (Ashford A.C) =19th 102 points with Lauren Bamford ( Ashford A.C).Holly Fletcher (Blackheath & Bromley ) 24th 94 points. Abigail Purkis (Ashford A.C) 34th 65points. 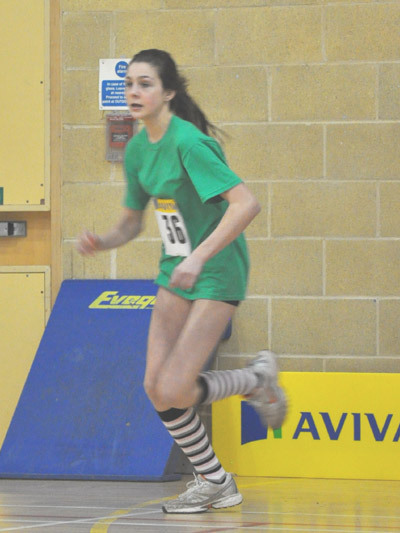 Sophie Hamlyn (Ashford A.C) ran the in the 4x2 lap relay.